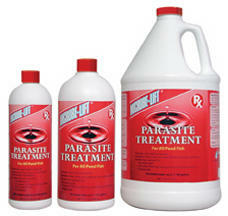 Microbe-lift Parasite Treatment (ICH-OUT) promotes rapid relief of Ick and Parasitic Diseases for all pond fish. Combines three of the most preferred anti-parasitic ingredients as well as a topical treatment for an effective treatment for Ick (white spots) Trichodina (flicking, flashing, excess mucus production) and Chilodonella. Safely helps to reduce the chances of secondary infections and will not burn. Intended for use with all pond, ormamental fish and aquatic life. Add one oz per 120 gallons (one cup per 960 gallons). Since parasites hatch over a continuous timeframe after pond water is over 65 degrees, several treatments are recommended. First treatment encounters parasites on outer surfaces of the fish. Second and third treatments kill the hatching and free swimming parasites. Space treataments 24-48 hours apart. Contains formaldehyde, methanol and malachite green, to kill parasites. Contact the Pond Fish experts today at (818) 353-5131.